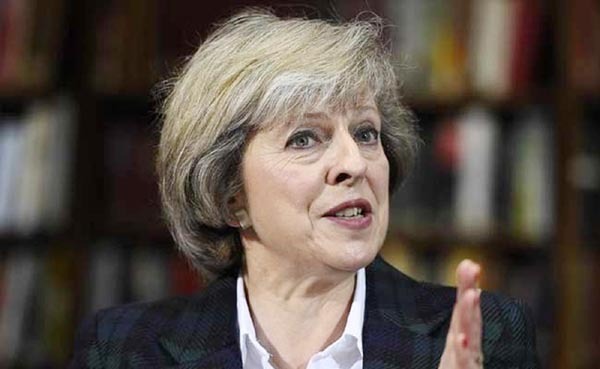 Home Secretary Theresa May, the front-runner who campaigned for a \"Remain\" vote in the June 23 referendum, said Britain needed to be clear about its negotiating stance. The favourite to become Britain's next prime minister on Sunday vowed to push for an EU trade deal that limits immigration, as a law firm warned Brexit needed parliament's backing to begin.The shock June 23 vote caused upheaval in British politics and financial markets, leaving lawmakers at odds over what negotiating position to take and when to begin the official exit procedure from the European Union.Though she campaigned for the "Remain" side, interior minister and Conservative leadership frontrunner Theresa May has said she will honour the result of the referendum and has ruled out holding a general election before 2020. "The Brexit vote gave us a very clear message that we couldn't allow free movement (of people) to continue as it had," May told ITV, adding that she would seek a guarantee for the status of EU nationals already in Britain. "It's also about ensuring that we get the best deal possible on the trade of goods and services," she added.German Chancellor Angela Merkel has insisted a British trade deal would have to include freedom of movement.The five rival contenders to succeed Prime Minister David Cameron, who resigned when Britain voted to leave the EU last month, have disagreed on how quickly the country should trigger its exit process.May, who polls indicate is the most popular candidate and who has strong backing from Conservative Party MPs, has insisted there should be "no timescale" for the exit. But rival challenger Andrea Leadsom has pushed for the process to begin quickly.Once Britain triggers Article 50, the legal procedure for exiting, it will have two years to negotiate terms.It faces a legal challenge from law firm Mishcon de Reya, which on Sunday said it would argue the government needs the backing of parliament in a vote to act. "The outcome of the referendum itself is not legally binding," said partner Kasra Nouroozi. "For the current or future prime minister to invoke Article 50 without the approval of parliament is unlawful. "Both of Britain's main parties were thrown into disarray by the vote.Jeremy Corbyn, leader of the opposition Labour party, held tenaciously to his position on Sunday after a mass rebellion against him by lawmakers who passed a no confidence vote in him by 172 to 40 last week.Corbyn, who has crucial union backing and was elected last year in a landslide by ordinary Labour party members, urged his colleagues to respect the party grassroots. "I am ready to reach out to Labour MPs who didn't accept my election and oppose my leadership," he wrote in the Sunday Mirror.Conservative MPs are due to begin voting this week to whittle their five candidates down to two. The contest has proved turbulent so far.Last week former education secretary Michael Gove dramatically pulled support at the last minute from his close ally, former London mayor Boris Johnson, in order to launch his own bid. "I love my country, I could not recommend that Boris be prime minister," Gove told the BBC on Sunday, when faced with accusations that he had knifed his friend in the back.The incident was not mentioned in Johnson's first column in the Daily Telegraph since the defection, in which he criticised an outpouring of support for the EU that followed the vote. "There is, among a section of the population, a kind of hysteria," Johnson wrote, describing protesters who marched over the weekend against Brexit as being in "a state of some confusion about the EU".Johnson insisted that it would be possible to both limit immigration and secure a free-trade deal with the EU without tariffs or quotas. "The future is very bright indeed," Johnson concluded.